The benchmark price of iron ore tracked higher again on Wednesday and is up more than 14% from lows suffered early March. 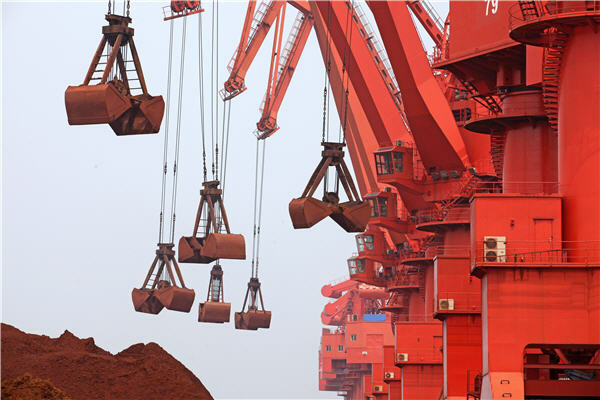 According to data from the The Steel Index, the import price of 62% iron ore fines at China's Tianjin port added $1.20 to $119.40 per tonne as imports from top consumers China is expected to resume its record breaking pace. After a steep drop off in February of more than 25 million tonnes mostly attributed to seasonal factors, Chinese steel mills and traders probably made the most the most of the fall in the price to a near 18-month trough to pick up the raw material. The surge in imports come despite record-setting stockpiles of the steelmaking ingredient at China's ports which according to state news agency Xinhua grew to 108.3 million tonnes this week. As an indication of what may be expected, iron ore exports to China from Australia's Port Hedland, which accounts for roughly 20% of the seaborne trade, jumped 27% in March from February to 27 million tonnes. According to Reuters many mills also prefer to buy imported ore as the use of letters-of-credit allowed them to delay payments, helping to improve their cashflow. About 40% of stockpiles at China’s ports are part of finance deals according to some estimates. Using inventories as collateral for loans has long been the practice in the Chinese copper trade, but more recently spilled over to iron ore as the market moved away from contract pricing to a spot market.